Medical device companies, hospitals, and physicians are anticipating an upgraded version of Google Glass, reportedly launching soon with new features that make the wearable more suitable for clinical applications. The next iteration of Google Glass likely will "include an adjustable eyepiece, longer-lasting battery and water-resistant properties," people familiar with the project told Bloomberg. The head-mounted display will feature a larger prism and two antennas for improved connectivity. Also, a recent patent application by Google describes an adjustable display mounting that may be featured in the next device, Tech Radar reports. These upgraded features make Glass more useful in a range of industries, particularly healthcare, where many doctors have found Google Glass a valuable time-saver and diagnostic facilitator, among other applications. Even though Google stopped commercial production of Glass earlier this year, the company said it will focus on the enterprise market by creating "Glass at Work," an initiative to encourage software developers to create applications for businesses. Most of the Google Glass devices sold last year probably went to business clients, many of which are in the healthcare field, said Ramon Llamas, an analyst at IDC, to Bloomberg. The next version of the device is likely to catch the eye of medical device makers and health systems looking to leverage cutting-edge Glass technology in products and services. One of CrowdOptic's clients, Endologix, Inc., an Irvine, Calif.-based manufacturer of endovascular stent grafts, plans to use the next version of Google Glass in physician training, according to the report. Endologix recently beamed video of an aortic surgery performed in New Zealand to its office in the United States. The company told Bloomberg that "up to 450 people will be able to watch a Glass-wearing surgeon from their desktops, asking questions and receiving answers in real time." Augmedix, a San Francisco, Calif.-based provider of EHR software paired with Google Glass devices, also is looking to take advantage when the revamped version of Glass rolls out. Augmedix's software automatically creates EHR reports as doctors interact with patients in real-time. 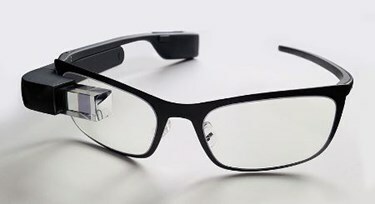 The company website claims doctors using Google Glass devices powered with their software spend 75 percent less time documenting a clinical encounter and 30 percent more time focusing on the patient. Furthermore, Google Glass continues to demonstrate its utility in clinical settings. Physicians at the Palo Alto Medical Foundation for Health Care, Research and Education are currently testing the device in documenting patient visits. Researchers at the University of Massachusetts Medical School found recently that Glass was effective in diagnosing poisoned patients in remote facilities with no toxicology expertise.